Since the early 1970s, Rackstraw Downes has committed himself to painting from observation, on site, from start to finish. He has painted both urban and rural landscapes as well as interior spaces, in New York, Texas, and Maine. Although he simply paints exactly what he sees, the ordinary sites become transformed into extraordinary scenes. In 2014 Downes spent the summer painting the site located in the northern part of Manhattan and his studio in SoHo. This film captures the painter working on site, outdoors and indoors, in an observational style. It expresses the atmosphere of his work as well as the surroundings. Some of his past works, which he painted in New York City, are also included in the film along with the footage which I shot, visiting those sites on my own. In addition, known as a skilled writer, Downes recites a couple of texts specially for this film. This film is a unique but truthful portrait of the painter, captured through my point of view and inspired by the painter’s art. Rima Yamazaki (山﨑梨真) is a filmmaker whose practice is an exploration of cinematic expression in documenting, studying and reflecting on art and architecture. She works as a one-person film crew; all her films are directed, photographed and edited by herself. Her films have been shown at various film festivals and venues internationally. 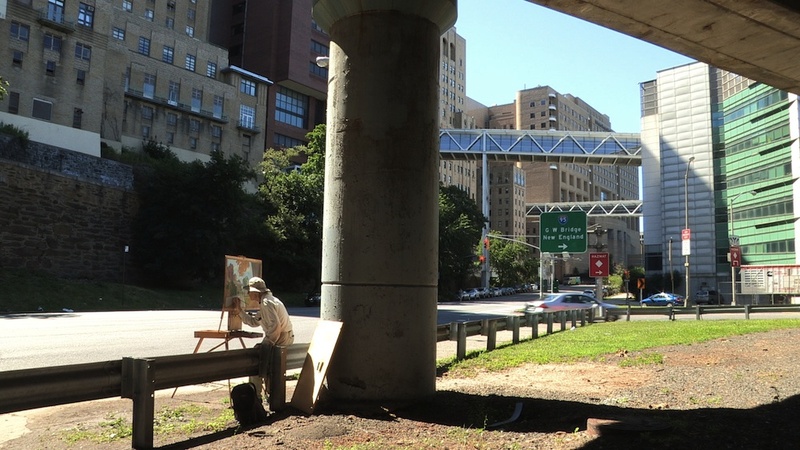 "Rackstraw Downes: A Painter," filmstill, photograph courtesy Rima Yamazaki.